Proclaiming 2017 as the “125th Year of Orthodox Christianity in Greater Chicago,” the region’s ruling bishops have endorsed a historic celebration to take place on Saturday, September 30, 2017. 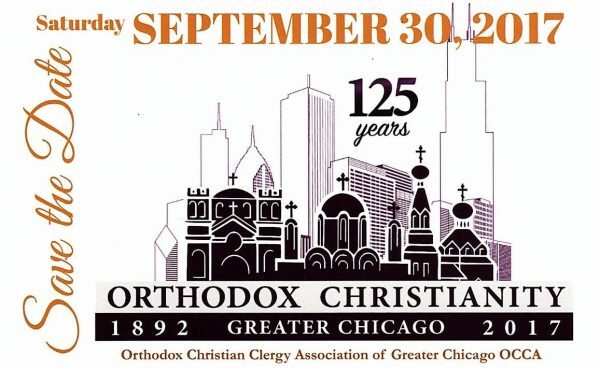 Sponsored by the Orthodox Christian Clergy Association [OCCA] of Greater Chicago, the commemoration will include the celebration of a Pan-Orthodox Hierarchical Divine Liturgy at Lane Tech Auditorium, 2501 West Addison at Western, Chicago, followed by an anniversary banquet at the Chicago Marriott O’Hare, 8535 West Higgins Road, Chicago. Chairing the event is Archpriest Nicholas Dahdal, Rector of Saint George Antiochian Orthodox Church, Cicero, IL. His Grace, Bishop Paul of the OCA’s Diocese of the Midwest and other Chicago hierarchs, together with all area clergy, will gather to concelebrate the historic Liturgy. His Grace, Bishop Irinej of the Serbian Orthodox Diocese of Eastern America, former Director of Education at Chicago’s Holy Resurrection Serbian Orthodox Cathedral, will deliver the homily. Responses will be sung by the Pan-Orthodox Choir of Greater Chicago. History reveals that the Orthodox Christian presence in Chicago began in the late 1800s with the establishment of the “Greco Slavonic Brotherhood,” which included immigrants primarily from Sparta and Corfu, Greece; Montenegro and Hercegovina, in Serbia; and Carpatho-Russians and Galicians from what was then the Austro-Hungarian Empire. After petitioning the ecclesiastical centers in their respective homelands, priests were sent in 1892 to serve the faithful under the existing Russian Orthodox Diocese of Alaska. This marked the establishment of Saint Vladimir Church [today’s Holy Trinity OCA Cathedral], Annunciation Greek Orthodox Cathedral, and Holy Resurrection Serbian Orthodox Cathedral. Today, there are nearly 80 parishes in the greater Chicagoland area.